Several of our DNC guys had a chance to participate in the USACA MMA event production of Lonestar Beatdown last evening at the Arena Theatre here in Houston. It was a terrific night of fights and results can be found on mopthemats.com. Highlights of the night included a near-brawl in the stands, a riveting 3-second knockout in the last fight of the evening, and a win by a ninja protege, Julian Vega. Julian trains under ninja Jordan Rivas out of Elite MMA Baytown aka “The Dirty Dirty Elite.” Good job to Julian, the two new champions Gilbert Jimenez & Jeremy Hontz, and the rest of the combatants who fought their tails off last night! LSBD 10 is in the books! 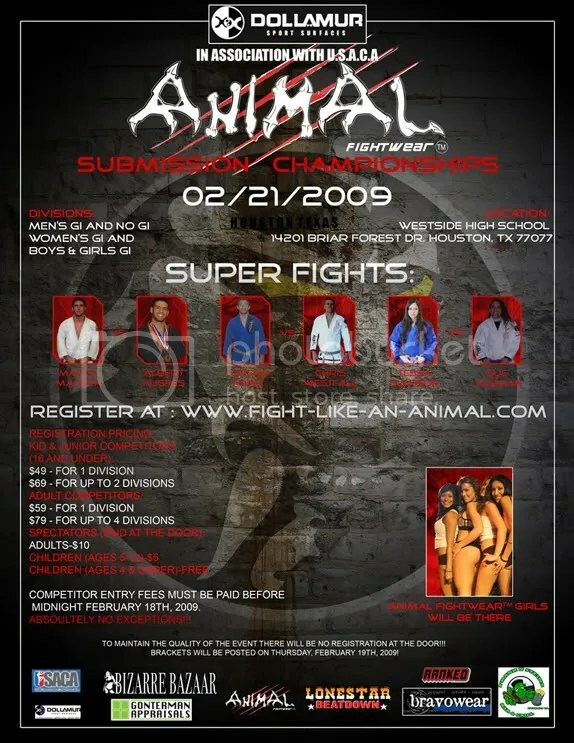 Announcing the Animal Fightwear™ Submission Championships on Feb. 21st! Our very own Jordan Rivas is competing against Chris Westfall in a superfight for this tournament. Come out and support Jordan and the rest of the ninjas as they fight for victory on Saturday, February 21st! By the way, don’t forget to mop the mats before you get out of here! America and Otis Redding said a change was gonna come and the DNC heard his call! No not really. Mike has been in our nation’s capital on professional business this past week but is returning to Houston on Friday, December 5th, right on time for the weekend festivities! 12/13, 1pm – Elite MMA In-School Friendship Tournament. Tentative Superfights include Chad Robichaux (Woodlands) vs. Frost Murphy (Baytown), Chad Kight (Woodlands) vs. Jordan Rivas (Baytown), and Ninja vs. ThinkAlpha for the DNC Championship 2008!